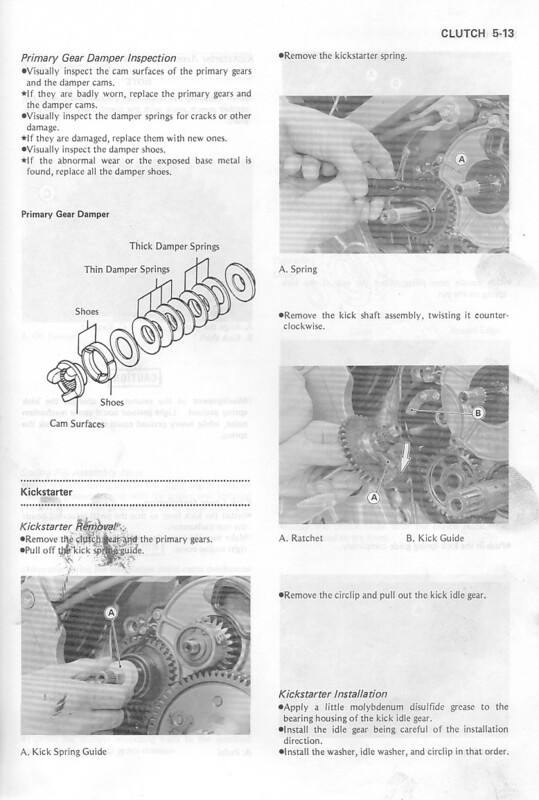 I've photocopied and posted out many copies of the workshop manual to KR owners all over the world. 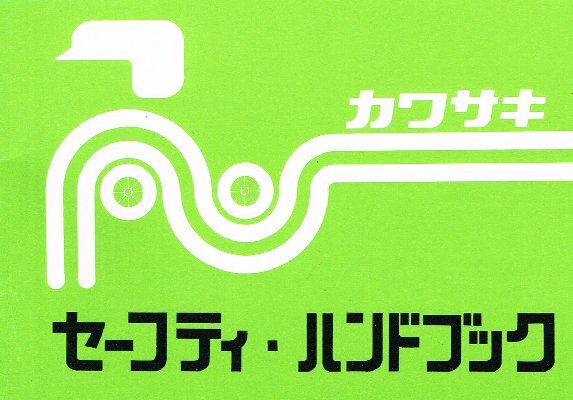 I intended to scan it all in and make it available on here but someone somewhere beat me to it. Luckily, before it disappeared offline, I grabbed a copy of everything and have finally got round to uploading it all here. Each chapter is a separate PDF - the quality isn't brilliant and the files are quite large, but it should tell you everything you need to know. 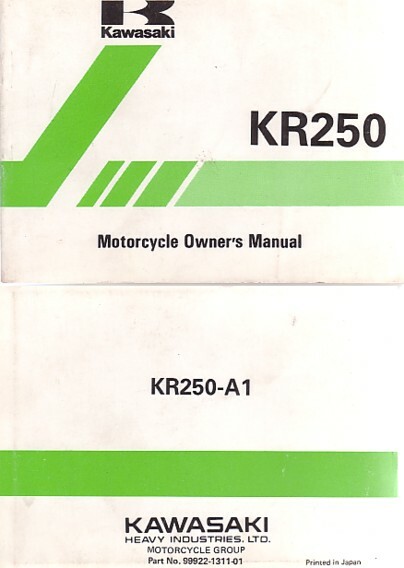 * Note that the front sprocket is an unusual spec, and many of the aftermarket parts listed online are incorrect, even when they specifically state they are for the KR250A. 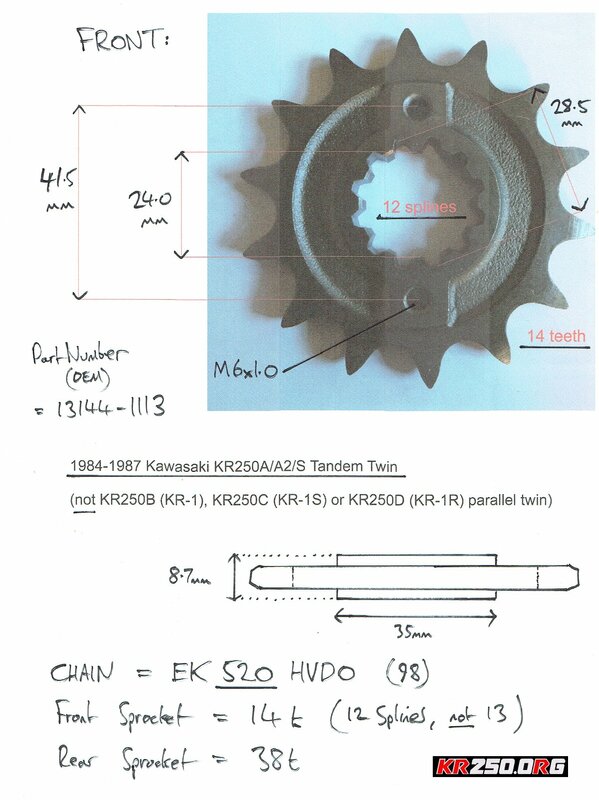 It's 14 teeth for a 520 pitch chain, but there are 12 internal spines not the 13 as seen on the KR-1/S etc. I'm still trying to source a supplier. I'm often asked where you can get hold of spare parts for KR's. 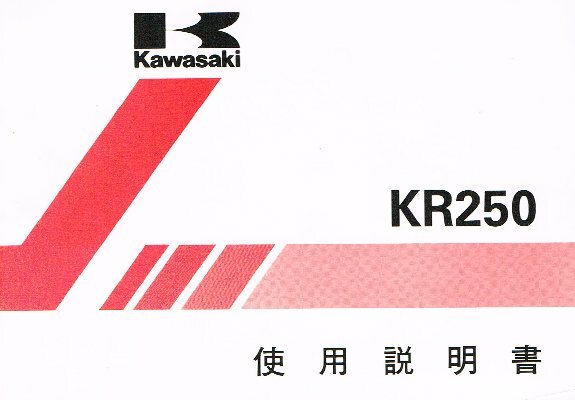 It's not as simple as walking into your local Kawasaki dealer although this is definitely worth a try if you're in one of the few countries that officially imported the KR in the first place (eg. Australia, South Africa). Some parts are still available new from Japan and these can be obtained through a specialist supplier like Z-Power in the UK - note that this mainly includes service items so don't get all excited about ordering up a brand new sidepanel. 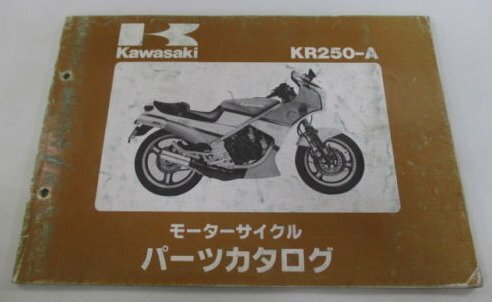 Some of the stocks of NOS KR parts were snapped up by individuals when Kawasaki dealers were dumping them - sadly I haven't got any but Aussie KR owners should contact Z-Power Australia (no relation) as they obtained a large quantity of NOS items. Otherwise you're stuck with hunting for used parts from breakers, or paying a fortune for the stuff on Yahoo Auctions Japan . If you can recommend a supplier of new or used parts, please let me know. 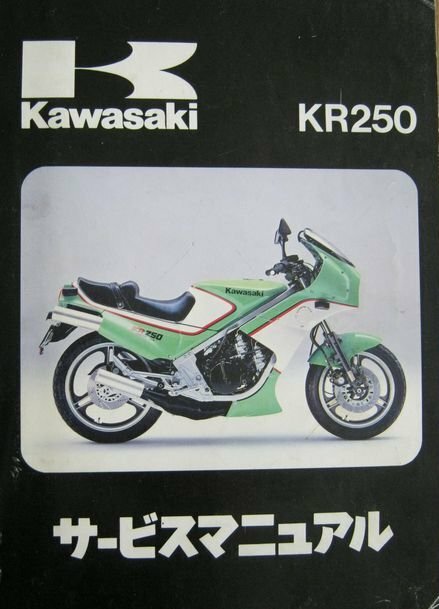 Of course, some parts are common to other Kawasaki models so although you might not be able to get a specific bit for your KR, it might be on your dealers shelf for another more up-to-date bike. 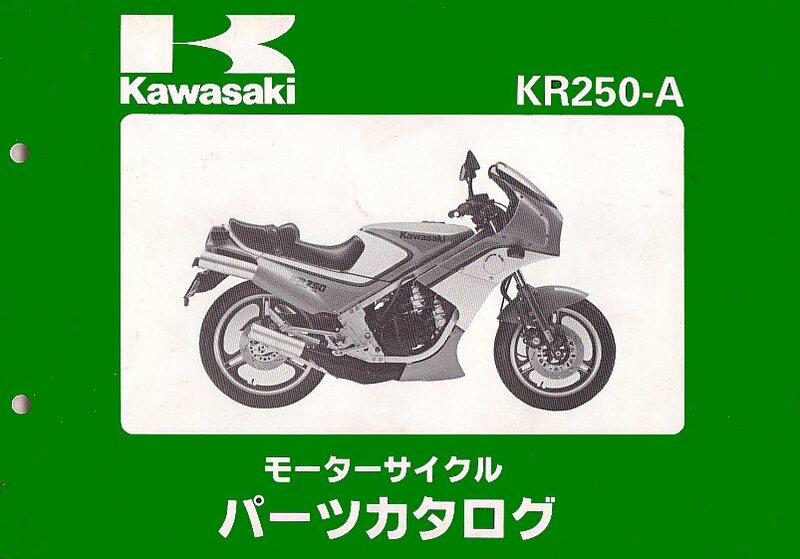 Therefore it's really helpful if you can provide the Kawasaki part-number when trying to get parts. 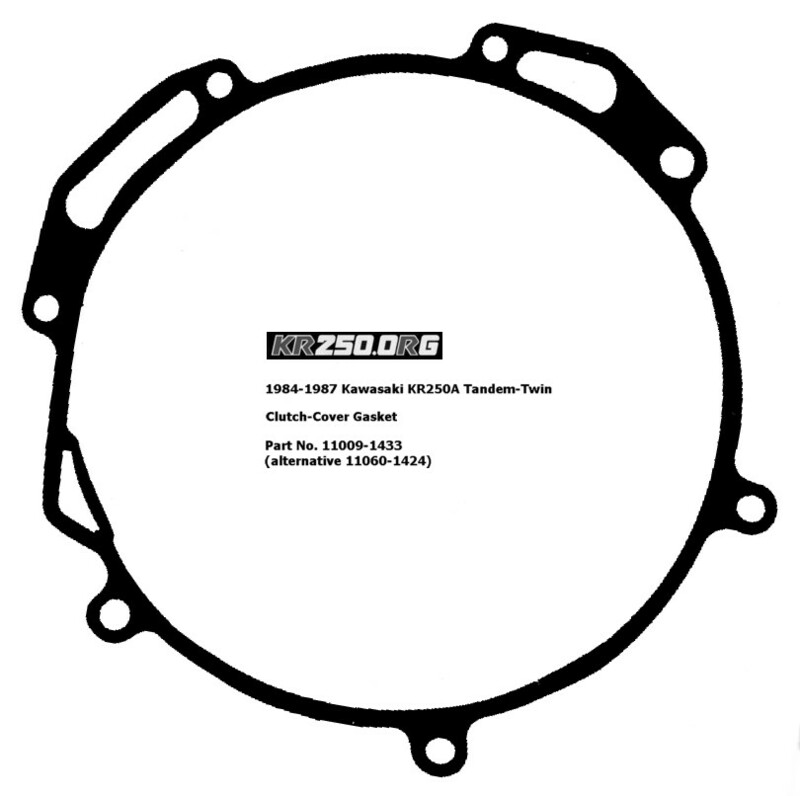 I can't remember who suggested it but someone came up with the brilliant idea of scanning some original gaskets in and putting them on here so that people can print them off (at 100% !) 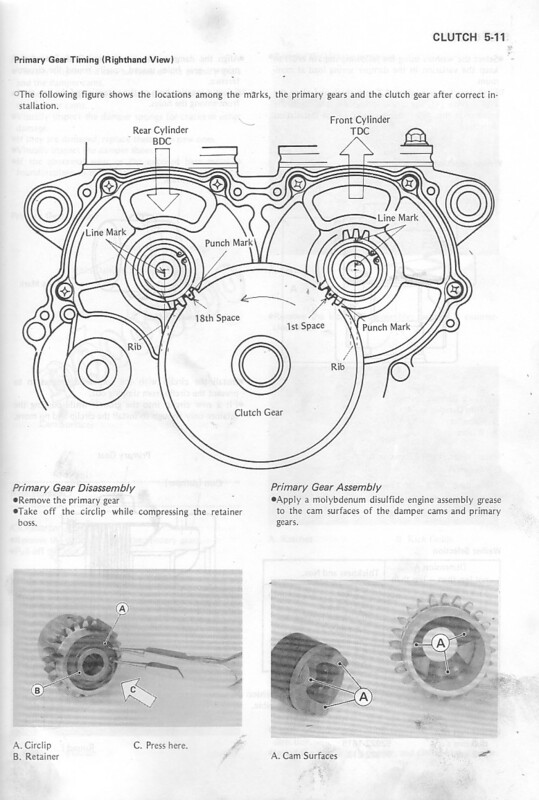 and make their own from ordinary gasket-paper. And I've finally got round to it. 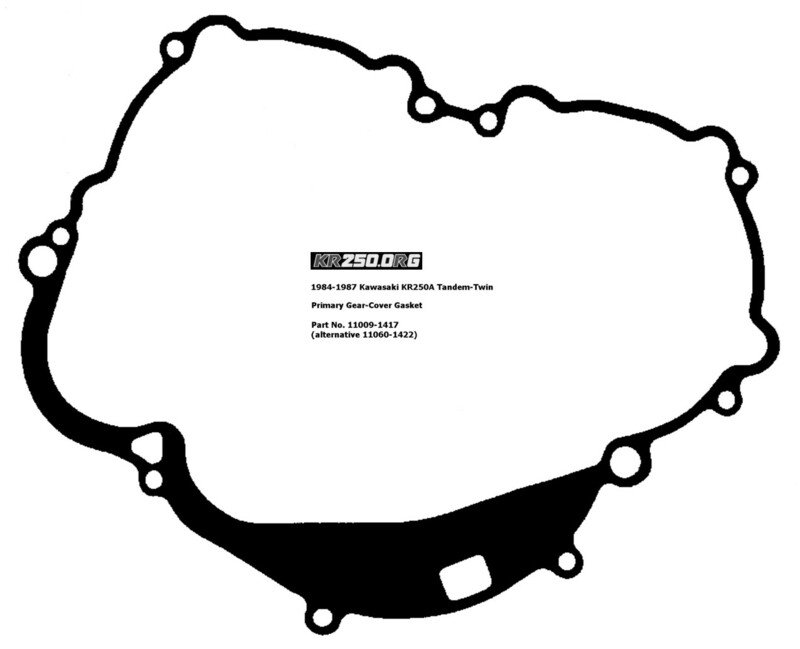 Obviously you can't do that for the head-gasket but I've included it anyway as the dimensions may help you find an alternative from another bike if you can't get the real thing. 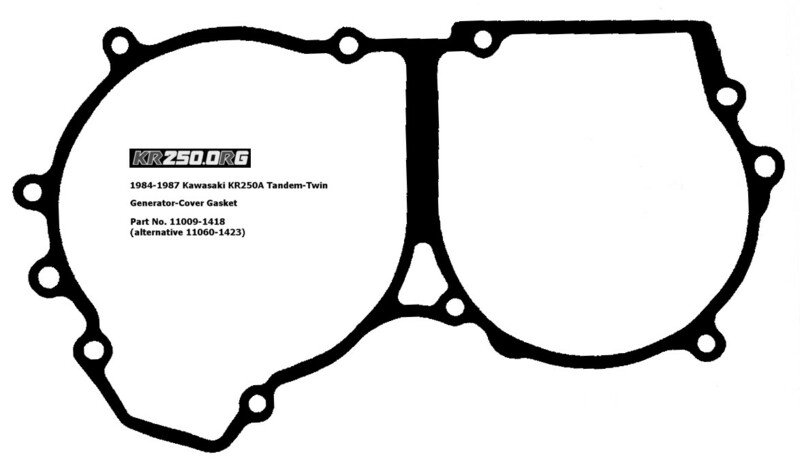 But very comprehensive aftermarket KR250 gasket sets are now available direct from Japan. I ordered one and it arrived in only 4 days, and looks spot on. 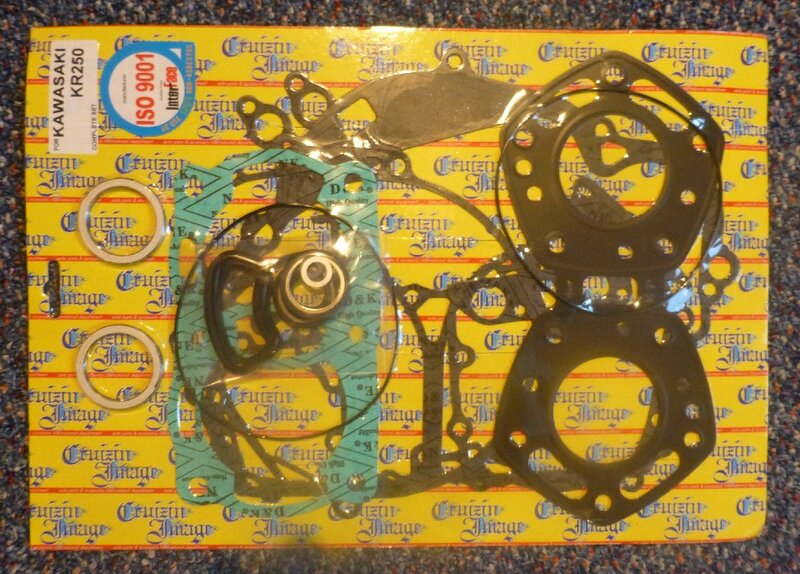 Look for CruzinImageUK on Ebay. Most owners I know have more than one KR - a main one and another one used as a potential spares source. Parts are hard to find these days and you never know when you're going to crash it or blow it up, so if you come across a cheap but salvageable bike in a breakers I'd suggest you buy it, just in case. The same is true if you spot someone selling a few used KR spares - I'll be happy to help you sell them on through this site if you don't need them for yourself. The KR has two separate CDI units - one for the front cylinder (mounted on the right side of the bike) and one for the back (mounted on the left). They have different part numbers and are supposedly not interchangeable - the rear one has an extra brown/white wire and therefore an extra pin in the connector. 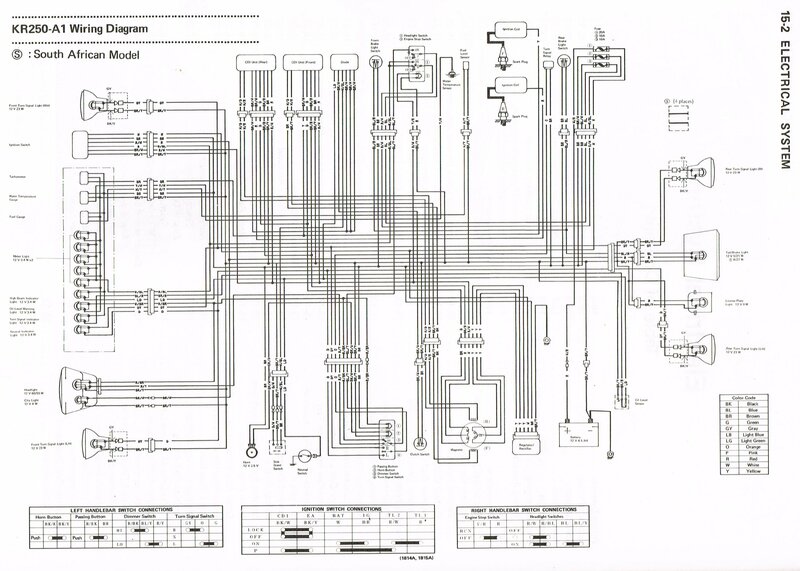 However, the extra wire is only used to provide the safety cutout for the sidestand/clutch switches and Fred is running two left units on his KR quite happily. 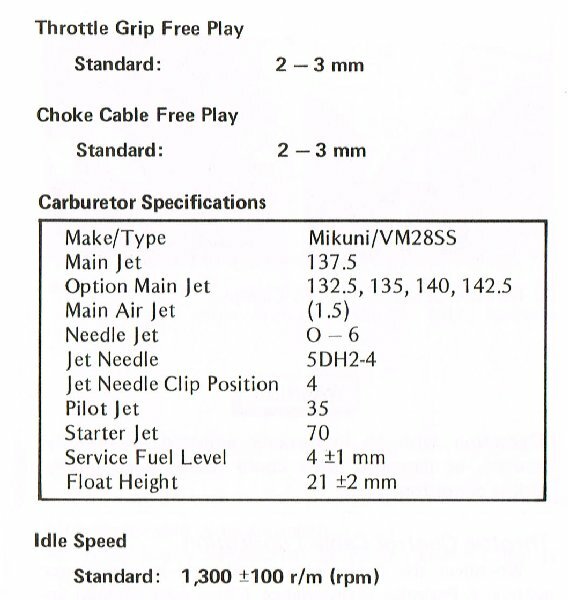 The coils also have different part-numbers but I think the differences are just in the mounting bolts. 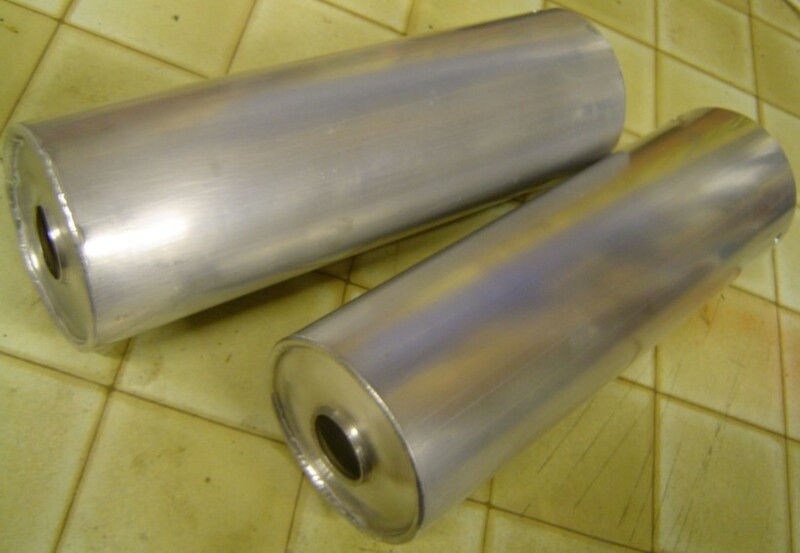 As with a lot of other performance two-strokes, the cylinder bores are nikasil-plated. This means that a good old-fashioned rebore to the next size is not possible. 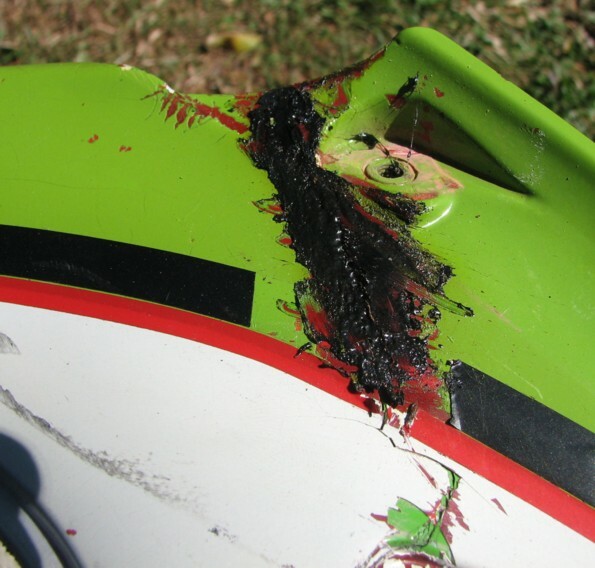 If your bore is badly damaged, the options are a new barrel (if you can find and afford one), a used barrel from a spare engine (see Tip No.1 !) or to get your barrel re-sleeved properly at an engineering shop. 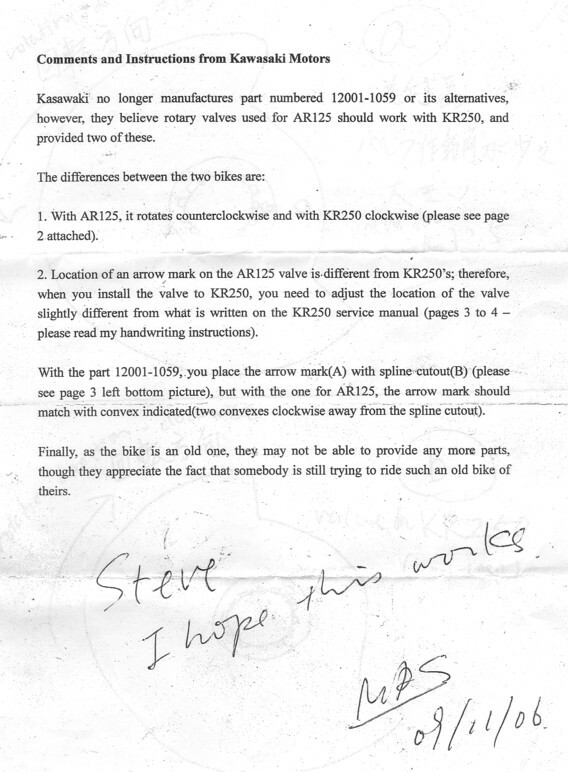 Chris of Netbikes in Australia knows of someone who still has some KR sleeves left. A snapped kickstart shaft is a common KR problem. They're difficult to repair but not impossible. 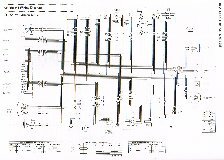 Fred fixed his by tapering and drilling the broken ends, joining them with a hardened steel pin, then welding the joint using special 'RSP' rods and machining back to size - see Fred's diagram for more details. 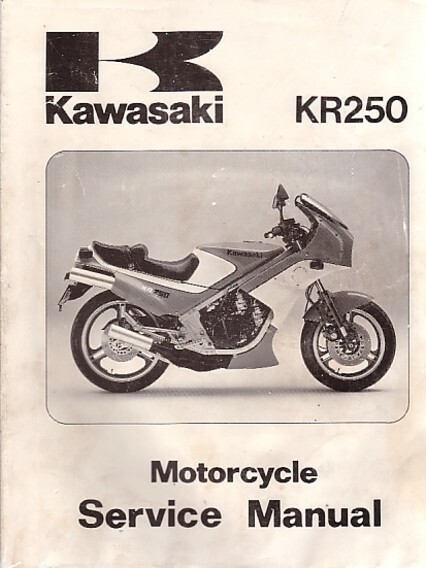 There was an original factory single-seat option that could be ordered with your new KR. 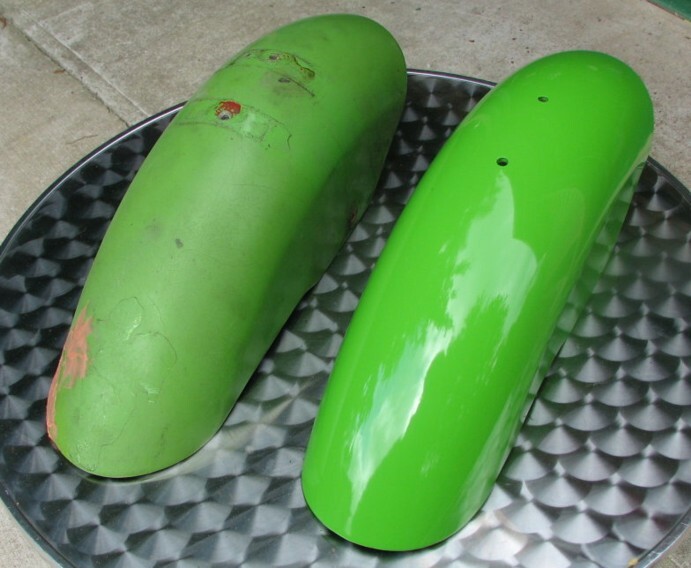 It replaces the pillion seat and is easy to fit. I got one from a breakers yard in Australia and another from Yahoo Japan but they're not that easy to find. 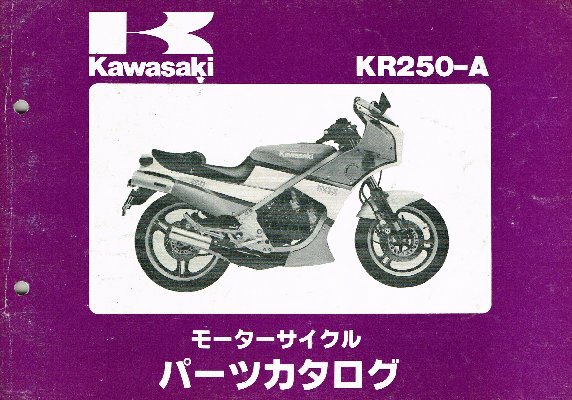 The fitting kit suggests that the more common GPZ400R (and 600R?) uses the exact same part but I'm not sure about this. 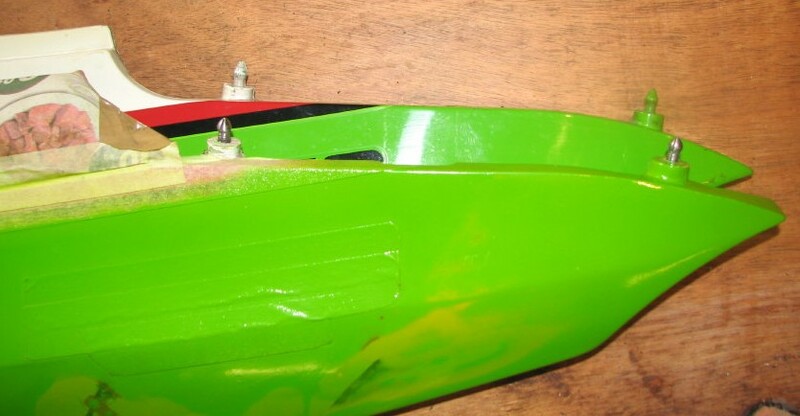 Another tip from Fred : he found two separate problems with his anti-dive system - first the internal plunger had seized so the anti-dive was permanently 'on', secondly the adjuster knob was slipping and not actually turning the nut underneath. I later found both of these to be true of my KR too - it's definitely worth checking yours to see if they're working properly. Strip the units, clean them and set them to '1' (minimum), or just toss them in the bin and fit a blanking plate instead. 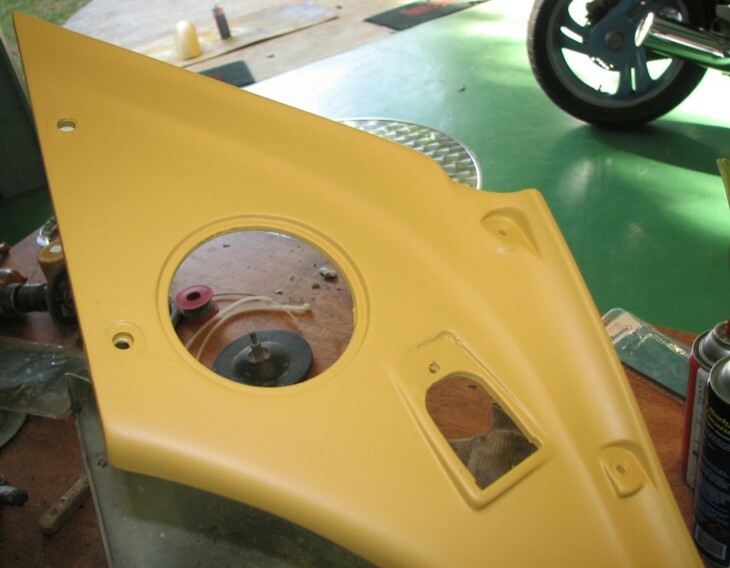 To remove the rear exhaust, you need to detach the rear subframe. 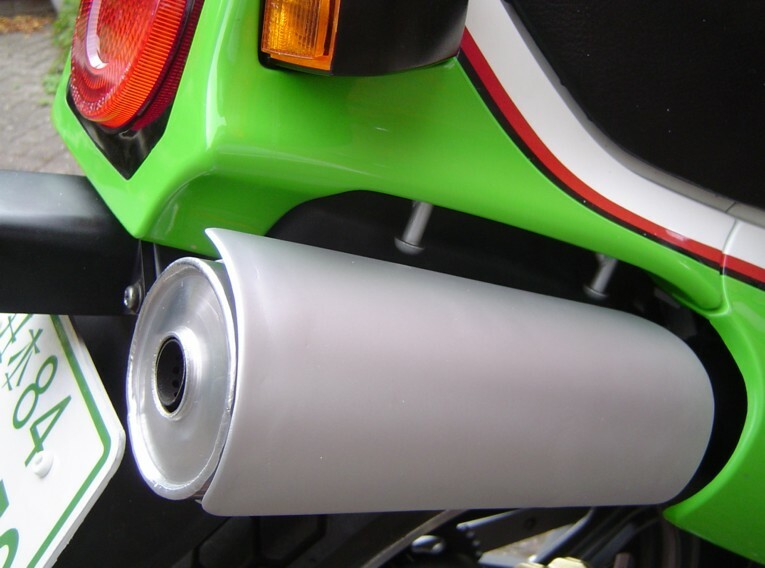 However, as long as you remove the battery box and loosen the rear mudguard, you can get enough clearance to extract the pipe without disconnecting the oil tank, wiring and all the other bits that the manual tells you to. 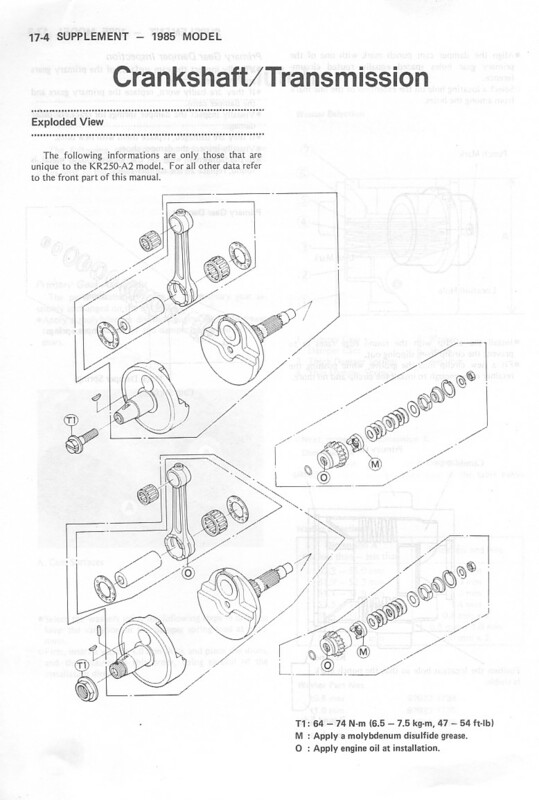 If you remove the rear shock, it's easy to get the damping misaligned. To reset it, set the damping knob to '1' and then rotate the entire damping adjuster unit and cable until the red line painted on the white plastic cog is visible in the middle of the window on the shock body. Then refit it making sure not to turn the unit as you're doing it. The handlebar clamps on a KR are a bit of a weak point - if you crash the bike, chances are it'll be the bar clamp that snaps. 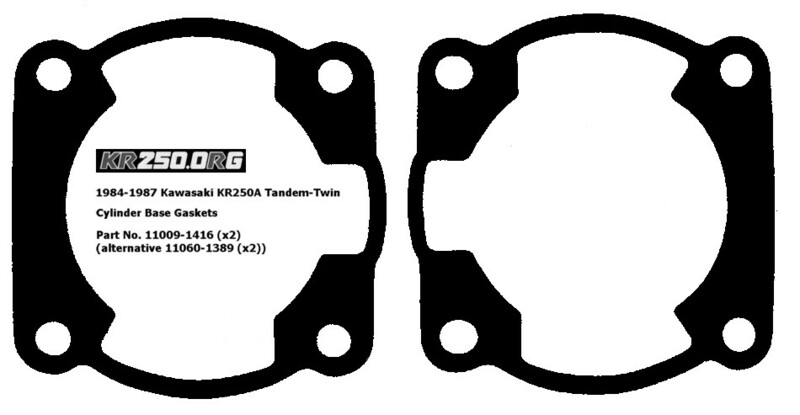 Bizarrely, the left one is still listed as being available new from Kawasaki but the right one isn't ! Apart from trawling the breakers yard what can you do ? 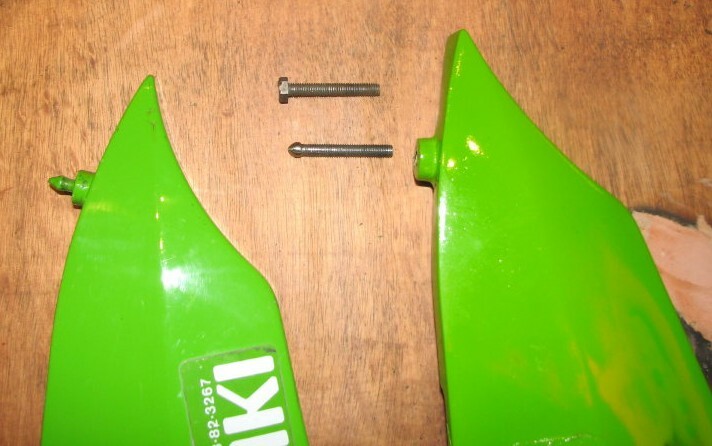 Well, other Kawasaki's of the same era had similar bar clamps, maybe they fit ? Some secondhand GPz900R clamps and bars came up on Ebay so I bought them to investigate - sure enough, they look the same but the mounting holes are fractionally out and of course the KR forks are 35mm and those on the 900 are 38mm. 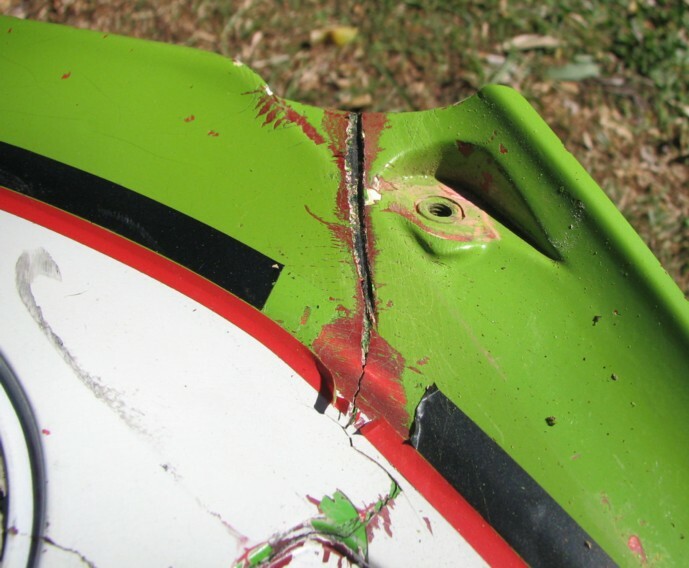 But if you slot the mounting holes slightly and get them sleeved to fit your forks, you should be able to get your crashed KR back on the road. 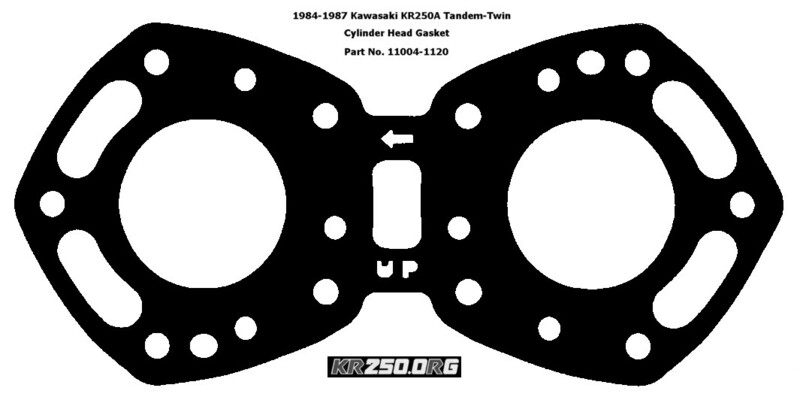 And GPZ600R ones (37mm) look like they'd fit too. Let me know if you've actually done this or have found another model that fits too. Why does only one of the fork tops have an air valve ? 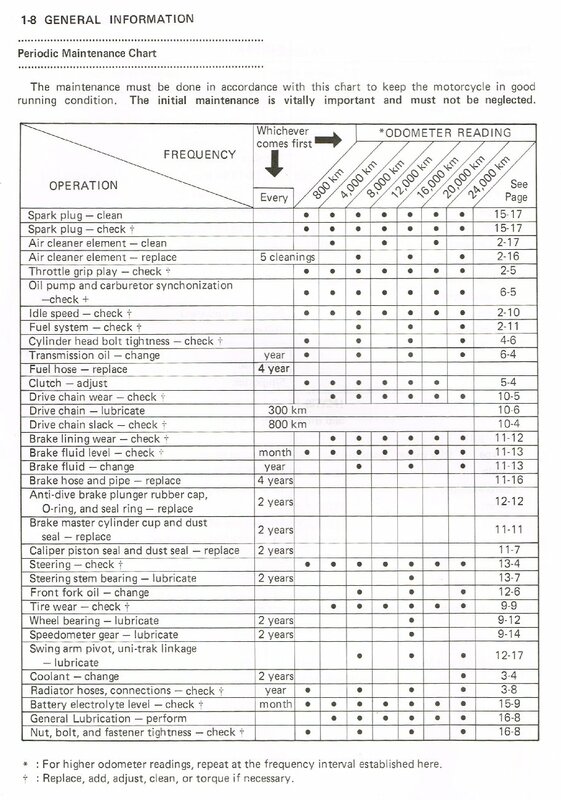 The manual recommends pressurising the forks to anywhere between 8.5 and 11psi. You should do this carefully using a hand pump, not a garage air-line. 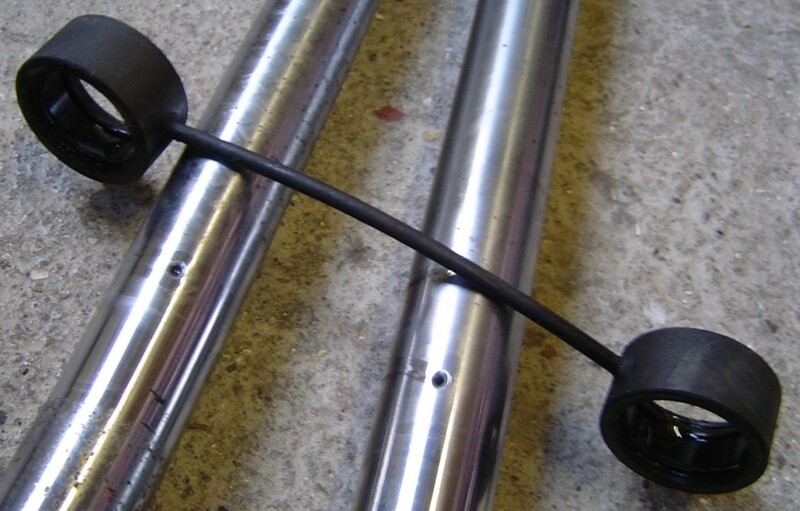 The forks are connected - that strange bracket above the bottom yoke actually conceals a 3mm hole drilled in the fork leg, and equalises the pressure between the two - see the photo below (but ignore the bent stanchions !). Needless to say, this bracket needs to maintain a good seal on the fork legs and you should take care when removing or refitting it. 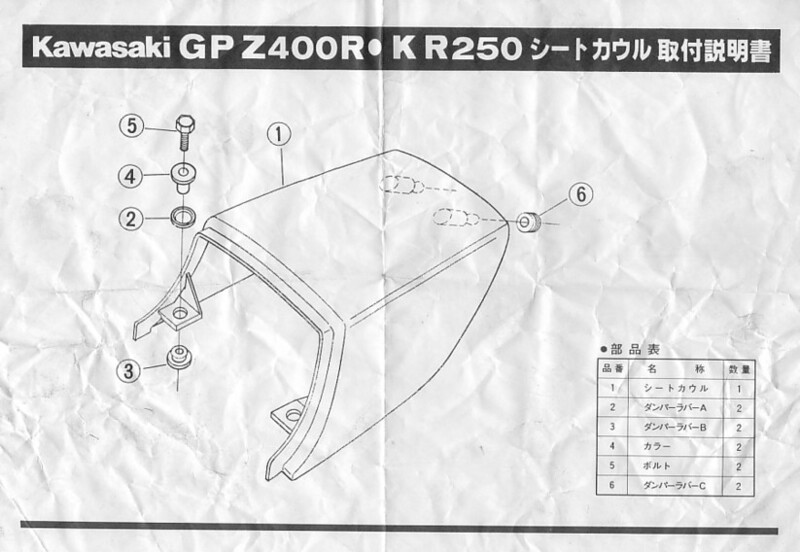 The GPZ600 has a similar set-up with the air-valve actually part of the bracket itself - they're not interchangeable with the KR though because of the wider diameter fork legs. It's very difficult to find new pistons/rings for the KR these days. 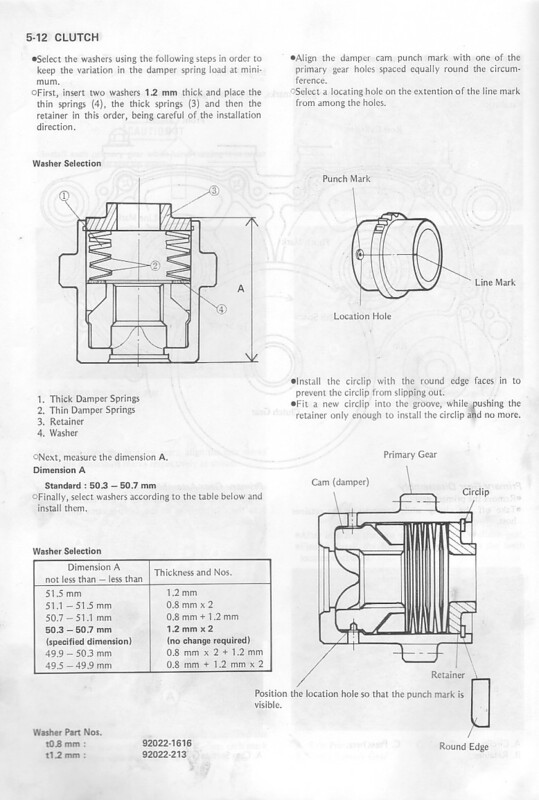 I've been looking into alternatives and the best tip so far is to use parts from the KMX125 (but +2.00mm oversize - standard KMX bore is only 54mm). I've not tried them myself but I've measured some and they appear to be the same in all dimensions. If you try them or you know of a better match, please let me know. 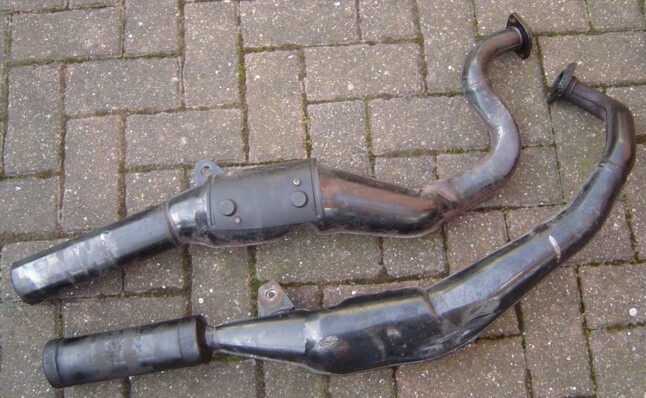 The exhausts on my bike were in a bad state. 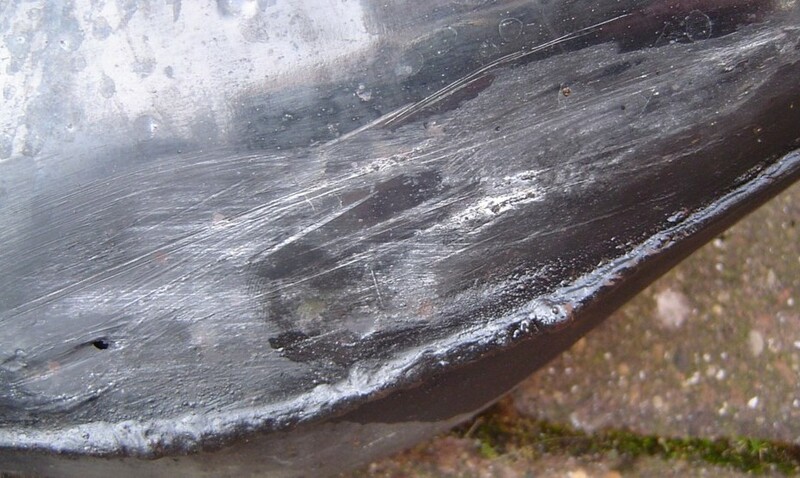 The lower pipe had crash damage and the upper one had some rust holes from water thrown up by the rear wheel. I attacked them with a wire brush and then used Chemical Metal to cover the holes and smooth out the scrapes. I sprayed them with a PlastiKote BBQ aerosol which gives a nice satin black heatproof finish, and of course fitted new end-can sleeves from Milan Racing. 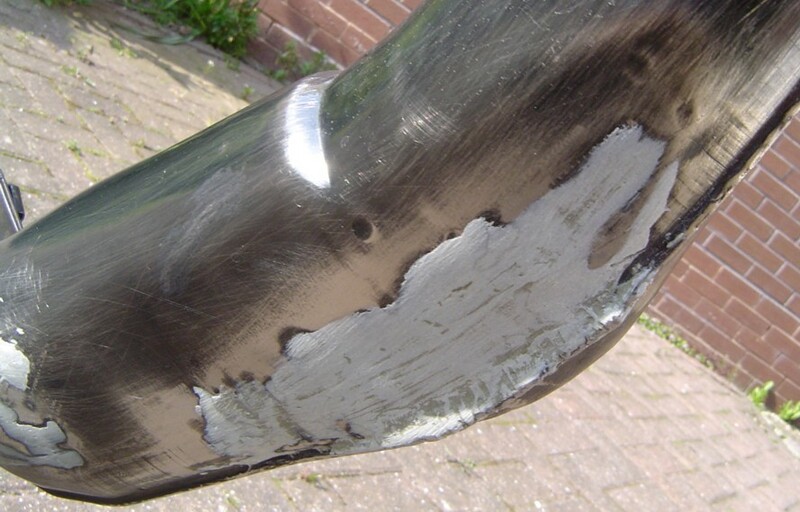 The heatshield on the upper pipe was sprayed with an ordinary silver aerosol. I'm very pleased with how they turned out, and so far the finish is proving durable. Being a tandem-twin design, the two cranks need gearing together. 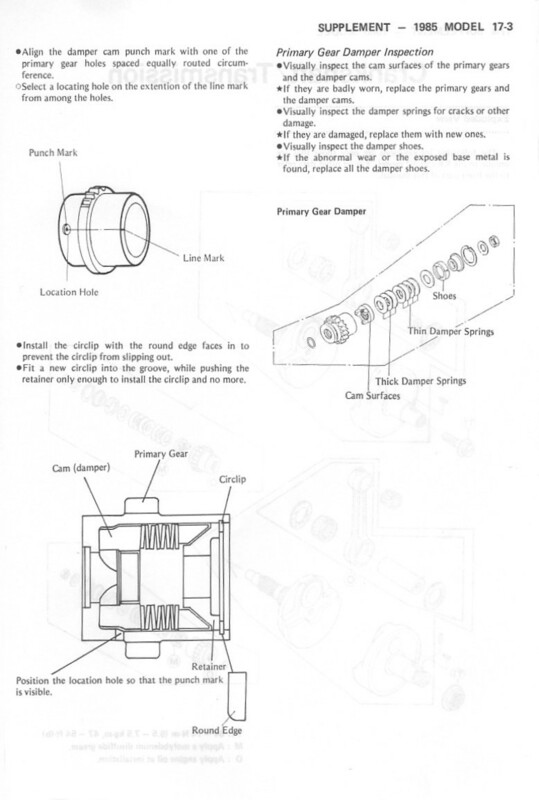 Each crank has a primary gear on the right-hand end containing a damping mechanism. 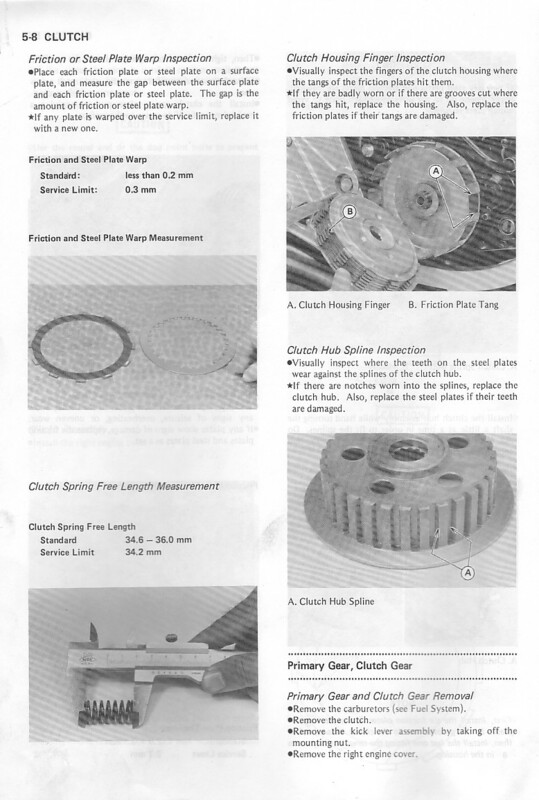 These engage with a large central clutch gear. 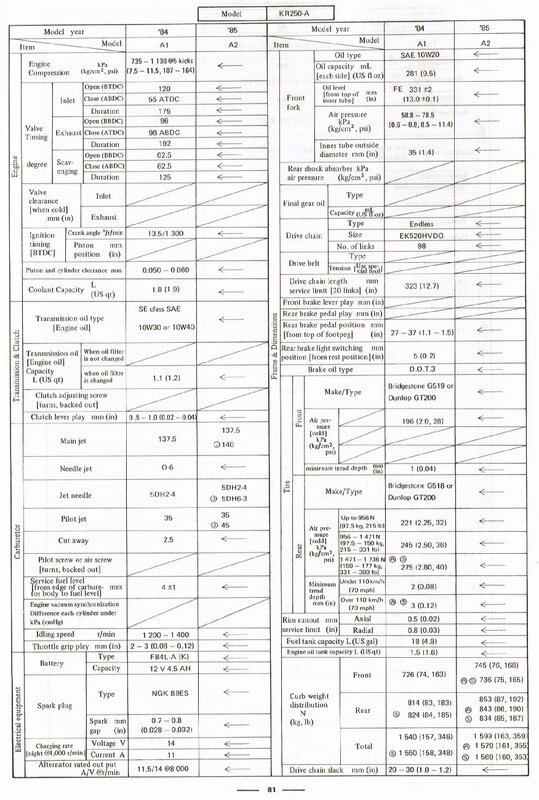 Obviously the relative alignment of these is critical to ensure the correct timing and there are a couple of scans from the workshop manual below to show how to achieve this. 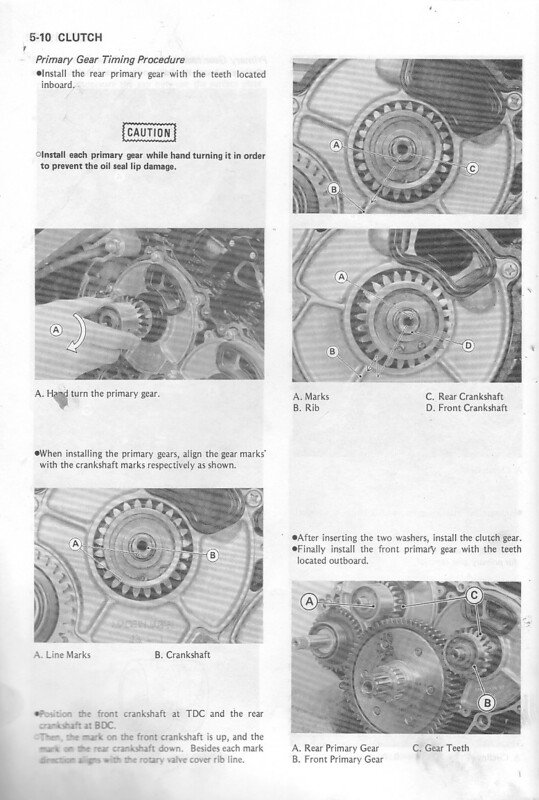 But there is a secondary factor too - the dampers in the primary gears must also be checked and adjusted if necessary by shimming. 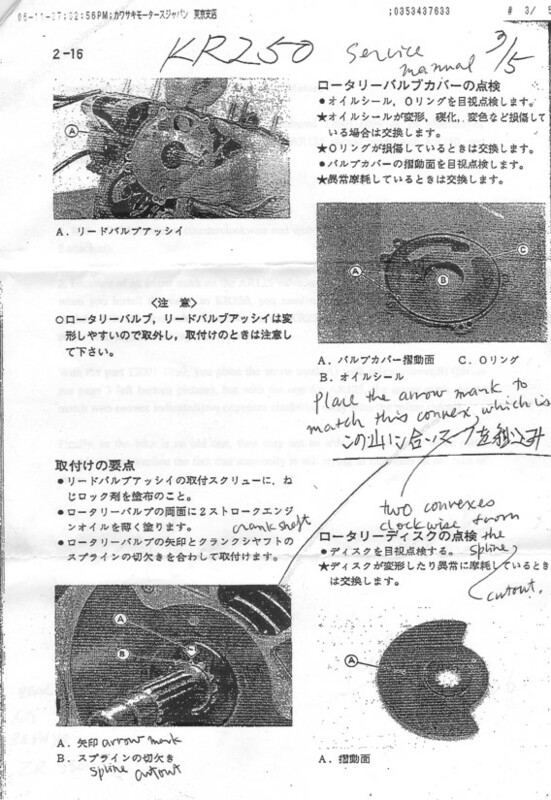 The common complaint of poor engine starting when warm is apparently caused by these dampers being out of adjustment - I don't understand this myself but it's commonly believed amongst the Japanese KR community and I'm happy to go along with it if it fixes the problem ! 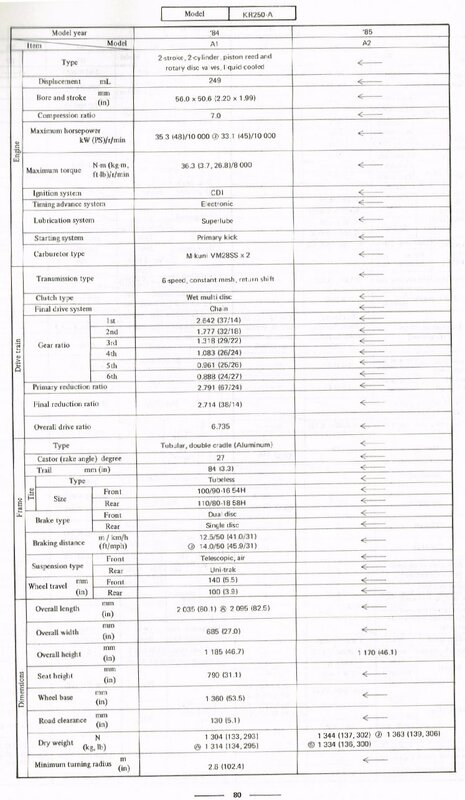 Again, the scans below give the required measurements, and the part-numbers for the two washers necessary to do the job. Once I've investigated this on my own bike, I'll let you know the results. 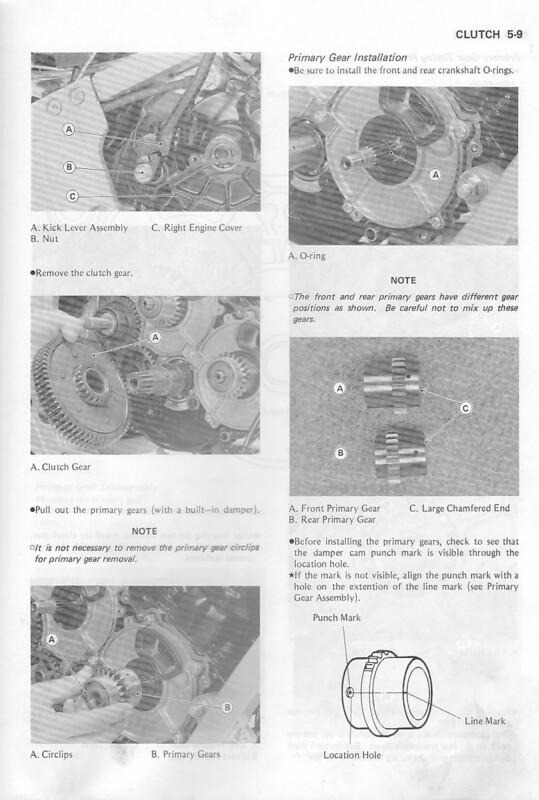 Note that the design of the primary gears was changed for the A2 model, released in 1985. From this point on, a nut was used to fasten each unit to the crank, and the shimming inside the damper is different. Care must be taken to ensure you don't confuse the two designs, although I've heard of engines that will run happily with one A crank and one A2 ! 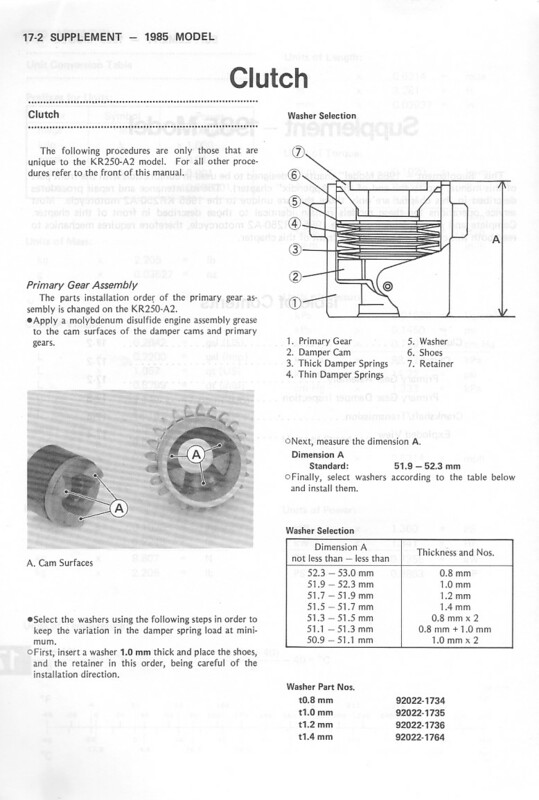 The pages below detail the changes specific to the A2 model. Damaged disc valves are not unknown on KR's. The metal part is tough but the nylon inner bit can tear or lose some teeth and then you're stuck. New parts are no longer available either. 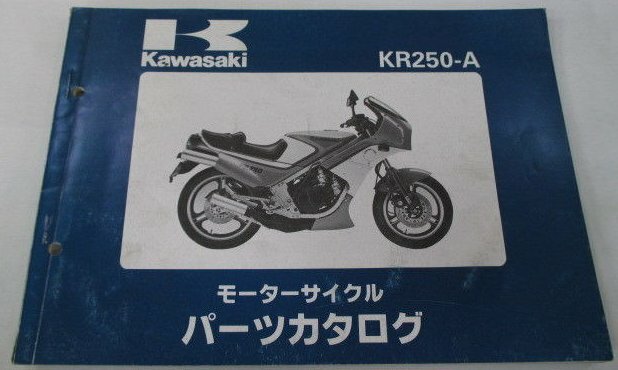 The AR125 used a similar design of engine and parts for those are much easier to find, but sadly they're not compatible. However, Harry (thanks mate !) 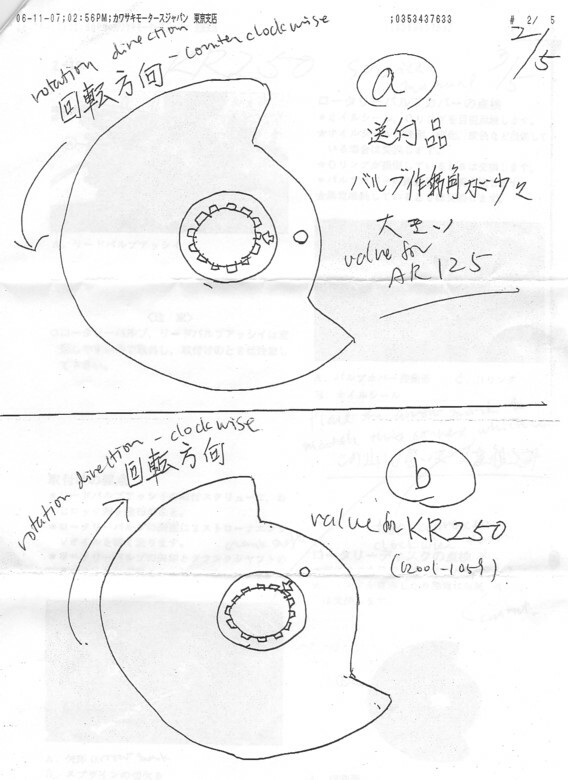 took this idea a bit further and has received the following informal advice from Kawasaki in Japan regarding the use of AR125 disc valves in KR250's. It appears to be as simple as reversing the disc and then ensuring the timing is correct, but I've not looked into this in more detail yet. Please let me know if this is helpful to you. 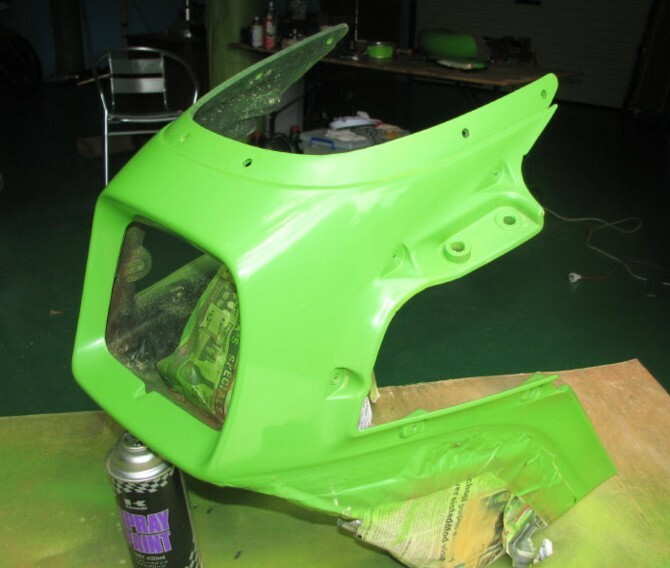 I thought you might be interested in some photos of the repairs I have been doing to some of the KR plastic. 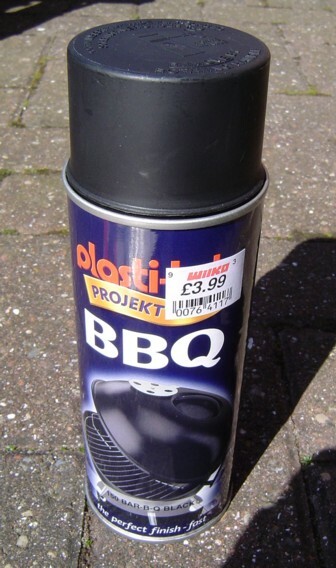 I couldn't find a glue that actually melted the plastic into itself, so I thought I'd give 'plastic welding' a try. I have never tried it before, but I have to say right off that it surely is the way to do it. 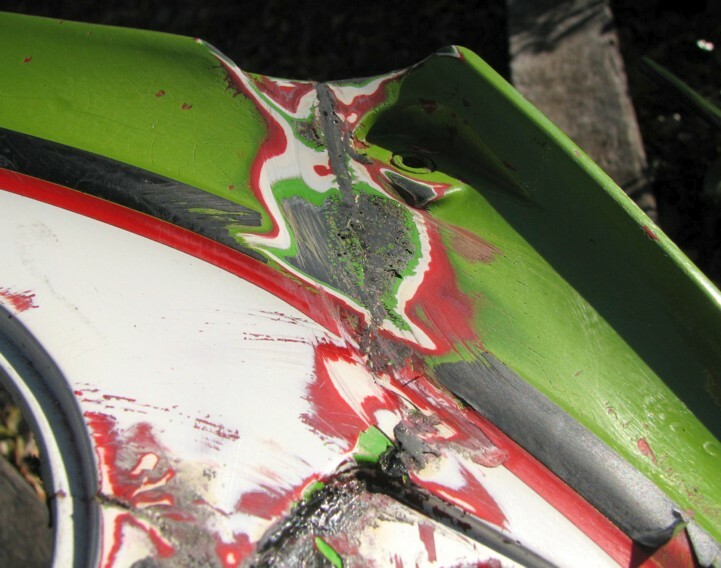 I'm sure that other owners out there in KR World are faced with the same type of damage but with no idea that it can be repaired so cheaply and successfully. It's actually fun to do, I hope it's useful too. As I don't have any flash machinery, everything I do is by hand, making it accessible to anyone who needs it. No special tools are needed for this. My old electric soldering iron is just over one inch (3 cm) across and the business end has been filed to a chisel edge (I put a 10mm socket there for size comparison). The cable-tie is used as a 'welding rod' as it is a very similar plastic to the panels, but much tougher - just try to break one. The first step is to clean the area, I used carb cleaner. Support the crack so that it 'wants' to stay together, using gaffer tape, clamps or brackets as needed. 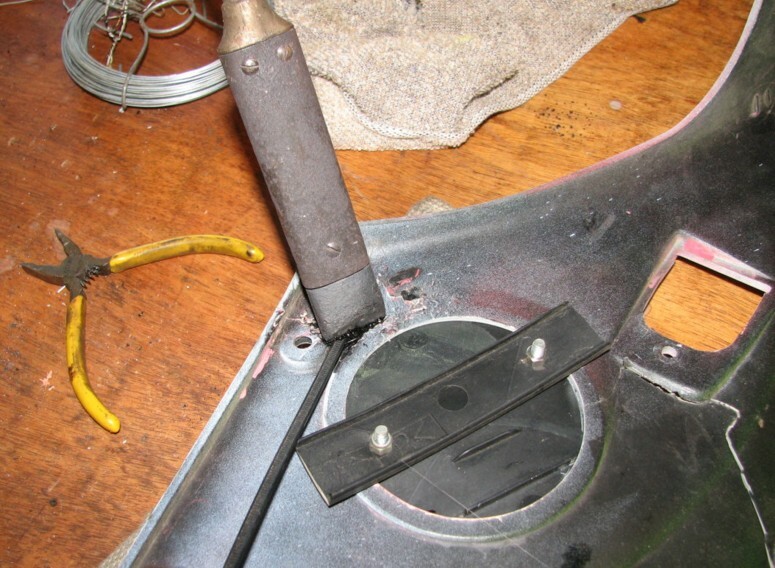 Then starting on the back, apply the edge of the iron directly to the crack for a few seconds to warm it and soften the plastic (take care not to overdo it), then slip the cable-tie between the hot iron and the plastic. You should hear a satisfying sizzling sound as the cable tie boils and fuses right into the body of the panel. 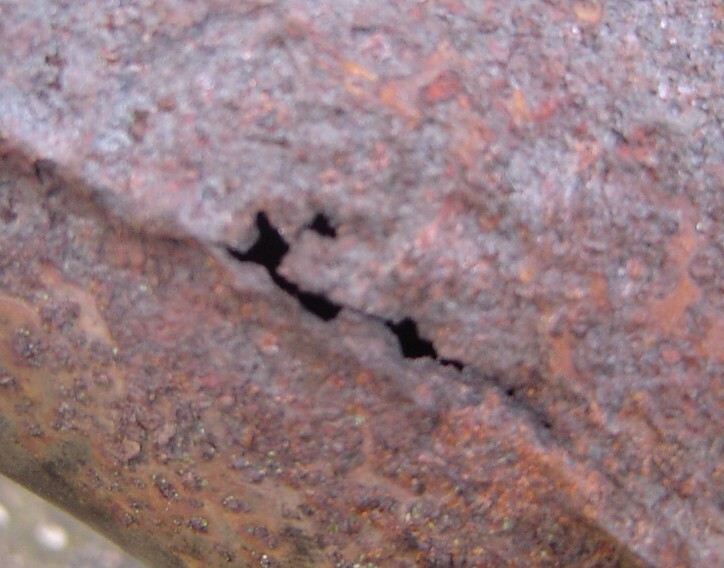 Remove the iron as soon as you feel the join is done. Either stop to let that small join cool off, or move to another part of the crack and work on that in the same way. Don't work in one continuous run or the heat may build up too much and distort the panel. Tack the crack in several places, then go back between tacks until it's all done. Don't struggle to make it neat at this stage. 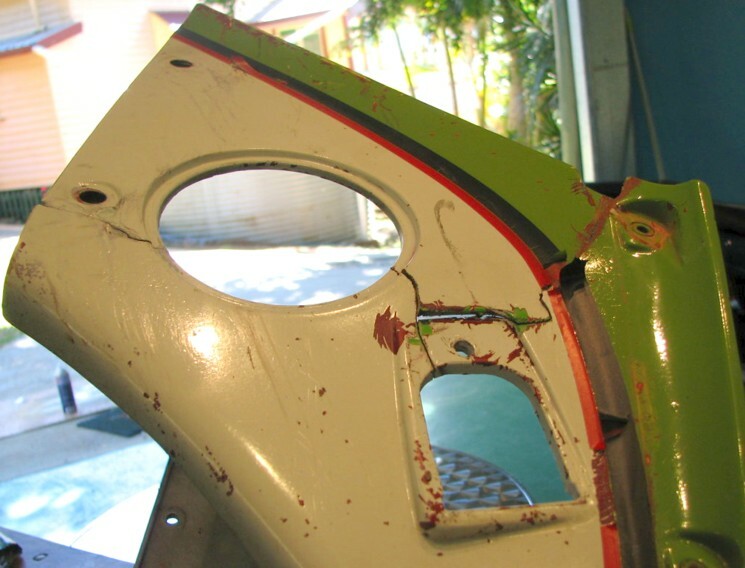 With the back done, turn the job over and remove the tape or other support. Now you need a steady hand. Carve a 'V' shaped groove right along the crack on the 'display' side of the panel. 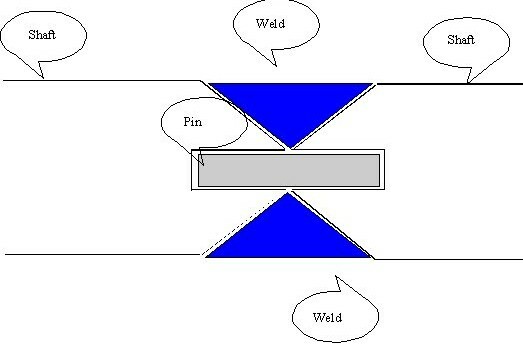 This is to allow the weld to be smoothed down flush with the original surface. 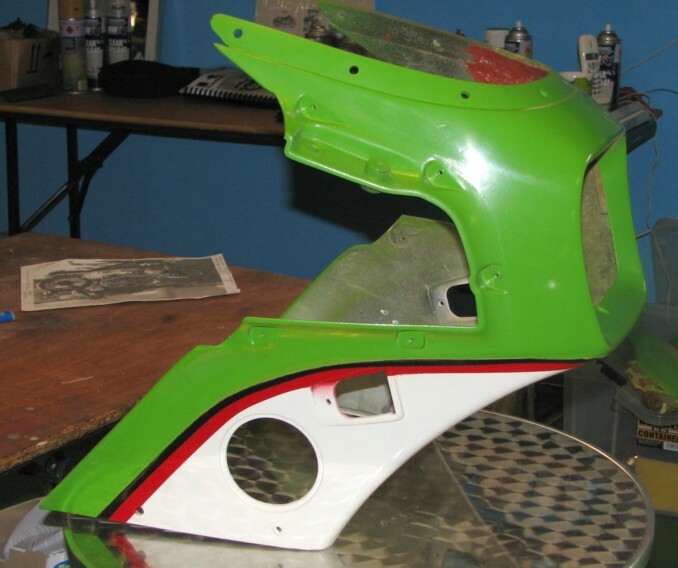 The easiest way to do this is with a grinding disc in an electric drill or Dremel. With the groove cut, weld it using the same method as before until it's just over full. Again, do it in short sections to allow cooling. When it's all done, slide the iron flat over the join to smooth it down. You can do the same to the back if it's on a visible bit. At this stage, it looks messy but it's very strong. 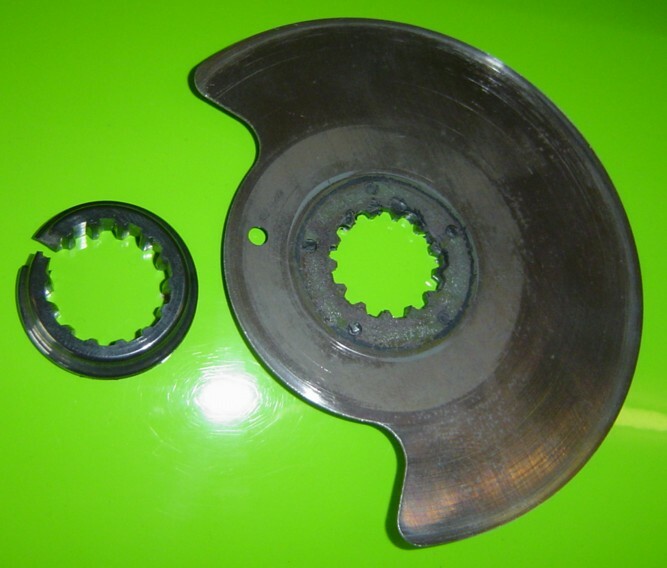 Those who had a grinding disc to use earlier now have an easy time of grinding off the excess. By hand I dread to think how long it would take as this stuff is TOUGH ! The observant ones will have noticed that the black & red stripes are the wrong way round on this bike ! Once ground flat, it's a simple job with normal filler, wet or dry rubbing down paper (used wet) and a fair supply of determination to get to the stage where you are ready for paint. That's another skill in itself of course - my painting of the red/black pinstriping isn't going too well. I'll need to do it again, treating this first bit as practice. Pleased with my progress, I attacked the other panels in the same way. 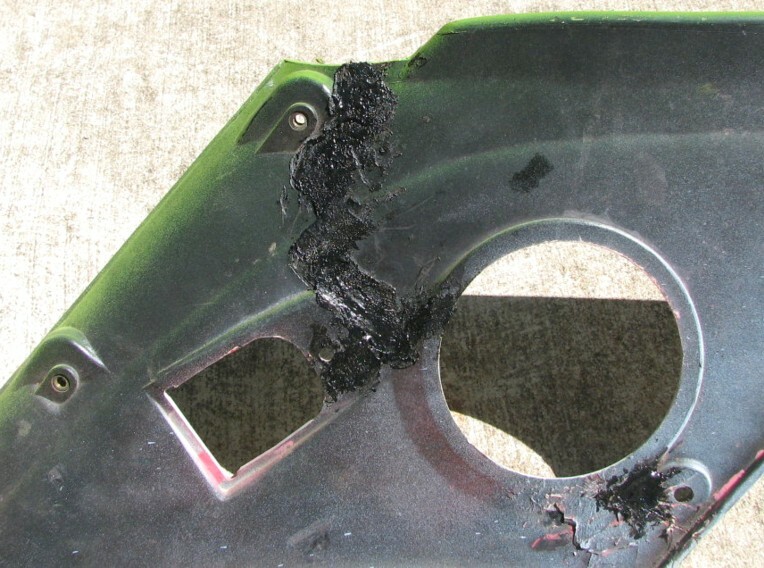 Note on the LH sidepanel that the locating lugs and the rear boss have ripped out entirely. I built up the boss using melted cable ties ! The lugs are made from filed down bolts. Once done, they plug right in just like the originals, only far stronger. 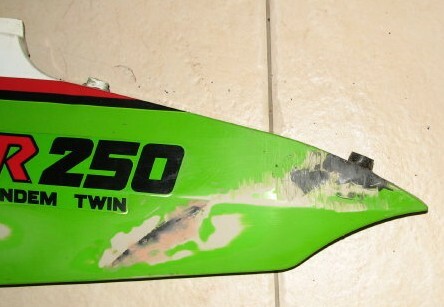 These front mudguards are from my two KRs. One's been repaired and the other hasn't, yet. But note that the finished one was actually worse than the other one when I started ! Well, I'm impressed, and determined to have a crack (!) at one of my own damaged panels now. Big thanks are due to Reg for taking the time to take pictures as he was working and then to write it all up in an easy-to-follow way.